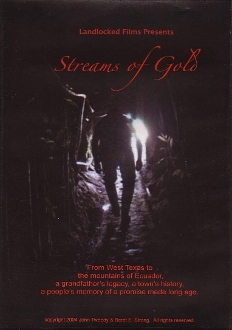 Streams of Gold tells the story of a filmmaker’s journey to uncover his family’s past in the gold mines of southern Ecuador. This one-hour documentary traces the history of an American company’s presence in an Andean mining town called Portovelo from the 1890′s to World War II, where filmmaker John Tweedy’s grandparents lived and worked for nearly 30 years. Silent film footage and stills from the 1920s and 30s are pieced together with the recollections of old miners, their children and grandchildren to form a moving mosaic of the struggles of a town whose history was intertwined with an American company for three generations, and whose uncertain future reveals much about the nature of global economics today. Released in 2004, “Streams of Gold was shown at over 20 film festivals in the U.S. and abroad, and broadcast on Free Speech TV.